Old Gray Mares was Sue’s idea. I met Sue in 2003 when I moved from California to Arizona. We live in New River, north of Phoenix. When someone new moved into the neighborhood, Sue was the first to stop by & make friends. Her next priority? To see if the new neighbor had a horse & wanted to go riding. Very active in her church and involved with her family, Sue was quick to see the good in everyone she met. Back then, Sue was riding Toby, a big-hearted bay thoroughbred. Despite some hot-blooded antics on Toby’s part, they were a great team. 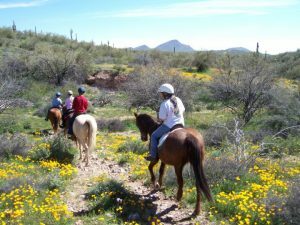 We rode all over the Tonto National Forest & Arizona State Trust land that surrounds our desert neighborhood. After a time, more of the neighbors were talked into riding with us & we began riding regularly together. Yes, we were all of an age, with grown children & some were grandmothers. None of that mattered because the most important thing to us is that we loved our horses & we did not quit riding for any reason! One day, Sue decided that our gang of women riders needed a name & she decided we should be called Old Gray Mares. She turned to me and quipped, “You should make a website for us. I’ll bet there are other Old Gray Mares all over the country and they just don’t know it yet.” Not only was she proud of our riding group, she was proud of the first website too. At the end of summer in 2004, her health threw her a curve. The diagnosis? Lung cancer, and no, she never smoked a day in her life. She had beaten cancer years before but it decided to come back with a vengeance that included a large tumor in her abdomen. The battle was on and her first round of chemotherapy was frightening in its intensity. But so was the rally that included friends and family, who supported Sue’s will to not give up. And when she could, we rode. Sue scheduled riding around her chemotherapy, treatments & surgery. 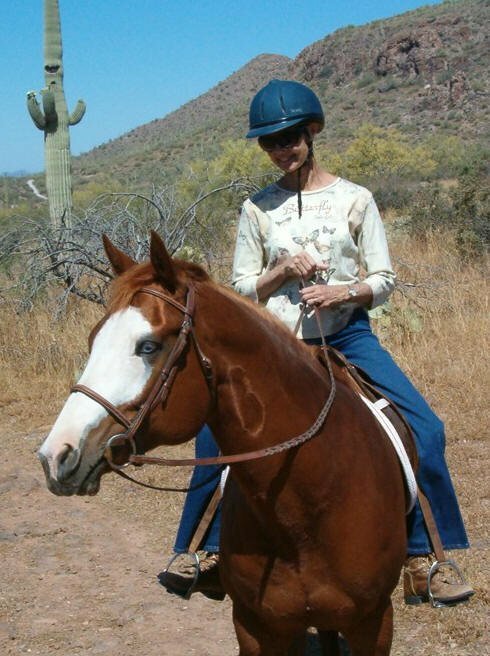 In the days that Sue’s health was precarious, Toby went to a home with a more active rider. In the mean time, Abby, her paint mare, acquired a reputation as a difficult horse by those who rode her to keep her fit while Sue recuperated. When Sue got back on Abby, much to everyone’s surprise, Abby was a different animal. She was calm on the trails, responsive, sure-footed & steady. Maybe Abby was just waiting for Sue and not willing to compromise with anyone other than her rider. We rode each and every time she would call & say “Wanna ride?” Sometimes there were long weeks between rides or we’d ride every day. It didn’t matter – if she could, Sue rode. And I rode with her. She called one winter day in 2008 & told me she was putting some stuff together, just in case. She asked if I could make sure that her ashes would be spread on our favorite riding trail, the one she named the Poppy Trail. I said, “Sure, Sue. But we don’t have to do that today, right?” And she laughed. In February of 2009, Sue was hospitalized and passed on February 27th. In April, a year later, Sue’s family united to spread Sue’s ashes on the Poppy Trail. Her son-in-law made a horse shoe marker & it’s placed on a spot along the trail that, if you didn’t know where to look, you would never find. I miss her terribly, to this day. Her dream of having a website, geared to encouraging women to keep riding, lives on. For many years this website sat dormant. Why revive it now? I’m not sure, but it just seems like the right time. Come back, read, but most of all, go ride. Sue would be happy if you did.